How much are people around the world paying per megabit for broadband access? The Telegraph (UK) says Brits are paying 17 times more than Swedes and 7 times more than the French.How much are people around the world paying per megabit for broadband access? The Telegraph (UK) says Brits are paying ¬¨¬£5.60 a month for each megabit per second (Mbps), which is 17 times more than Swedes and 7 times more than the French. Dirk van der Woude put together a chart of the average monthly price per Mbps paid by people in Asia and Europe (see below) relying on data from the Telegraph and Bruno Giussani’s blog post on the same subject. gathered by an individual blogger) is not the exact value of the MBPS in each country: it’s the amazing range. Switzerland pays 6 times the Swedish price, and 12 times the Korean price. So what matters here really is not the exact monetary value, but the spread, which doesn’t seem to have a specific correlation with affluence or other country wealth measures — and therefore is likely correlated to tech and market openness/competitiveness differences. Around the World? That’s more like Around Eurasia…What about North/South America & Africa? 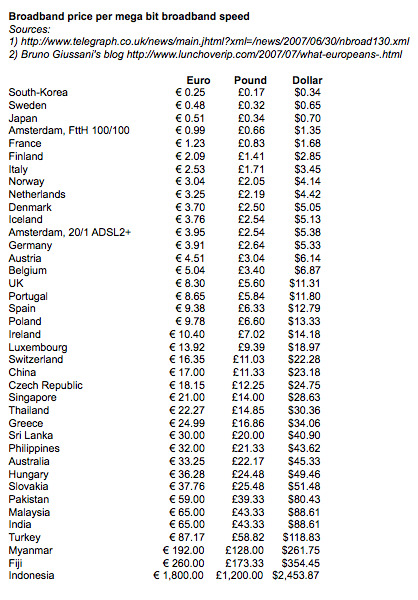 I am really surprised at the huge differential in broadband prices among countries. Would be helpful to drill into the factors that explain the differences. i am not agree with this price. As i know price of 2Mbps connection in India and Pakistan is $1400 and $1000 (per month) respectively. If u want to say about only download of 1MB. Then the calculation is not right also. You should have included US pricing. So-called “broadband” speeds in America are absolutely ridiculous. Our big-business rooted government just barely upgraded our notion of what constitutes a high speed connection, and the result isn’t all that great. Previously, a .2 megabit connection was considered broadband speed. Now that’s considered “first-generation” broadband (lol), with .7 megabits (like my DSL line) coming in at “basic broadband”. It’s a total joke. IMO, there should be no internet connection slower than 1.5 megabits. We INVENTED the Internet! No one should be using a connection slower than 5 megabits when Japan allegedly has a national average of 60 megabits. Allegedly, ours is 3. The average on Steam (Valve’s game service that you have to log on to in order to play their games) is .7. Hmmmmm…. In good news though, the highest speed a regular person in this country can get has just recently gone from 10 megabits (I think) to 50. The bad news is that the lowest priced line in Verizon’s FIOS suite costs $45 and clocks in at just 5 megabits. Additionally, the government doesn’t care at all about the speed of these “broadband” connections. All they support is “broadband deployment”. They’re helping the telco’s milk us out of our money paying for these crap slow connections. If they really supported Internet technology, they would force these companies into upgrading their standards to where we actually are competing with these other countries in the standards of connection speed quality and pricing. Cheapest offer with internet on its own – Irish Broadband. 18.95 a month for “unlimited” amount of downloaded information. and its for half meg! So your charts are pretty fecked up… I am not even talking about quality and upload speeds on this thing. WIMAX, all i can say about it. Uhh, in Australia I pay $45 for six GIG per month, don’t know where this $45 per MEG was sourced from! GREGR, perhaps read the article… its talking about SPEED not DOWNLOAD QUOTA. For Australia its talking about an average price of $45 per megabit of speed. When you consider Telstra’s prices for basic 256k/512k/1.5mb ADSL1 the ripoff price is about right. Now since the article, ADSL2+ adoption rates are rising and the average speed would hopefully be around the 6-10mbit range for about $50-80. If you take out Telstra’s bloated pricing (especially NextG mobile data), Australia would probably fare better on this table. In the UAE (specifically Dubai), Du telecom charges around $110/Mb/month for censored net access, probably around 10 times more than the UK. It gets worse, business charges are in the range of $40 per GB (thats bytes) used per month. To put that in perspective, downloading 50 gigabytes of data in a month – an average figure for a small office, will run you over $2000! And all of this is poor quality, heavily censored, rubbish connection served by a monopoly. Dubai needs to get its act together if its going to become a hub for new media in the region. i have this plan. they also give $6 worth free calls.